I’m heading for the High Traverse at Alta. It hasn’t snowed in a while so I have a choice of several traverse lines. I take the low one since I’m going all the way to the end. The lack of recent snow also means the traverse is just one long series of bumps, like small waves. I’m trying to maintain some speed so they’re a real pain. There are two reasons for my need for speed. One, I’d like to make it to where the traverse crosses over to the east side of the ridge without having to walk. Two, veteran traversers are notoriously short of temper with amateurs in their way. I survive the bumps and dodge some rocks. Even with 400 inches of snow, there are still some rocks showing in the well-worn traverse. They even put down some mats to help cover rocks where you cross the ridge. I do make it to the east side without walking. From there it’s a short way to the end of the traverse. On my left is Alf’s High Rustler which I skied earlier. Straight ahead is Eagle’s Nest and on my right is Greeley Hill. I start down toward Greeley Hill which is a wide open slope, but my skis are leading me left toward the trees. Despite no recent storms, the snow seems to get softer, deeper, and quieter so I head into the trees. The large evergreens are sparsely placed so there are many choices of line. The powder has been tracked, but it still skis like powder. The turns are easy and smooth. I’m not wasting energy. The pitch gets steeper, but I just sink a little deeper on each turn to check my speed. I have to choose between two paths and I choose the one on the right. I’m smiling because I made a good choice. The powder is deeper with fewer tracks. Eventually the pitch becomes less steep and I develop a bouncing rhythm in the fall line. I see the arrows leading me to the exit traverse. My smile gets bigger as I relish another memorable Alta run. I have already forgotten about the damn High Traverse. Later I check the trail map and find out that what I skied is called “High Nowhere”. That’s how you become an Altaholic. 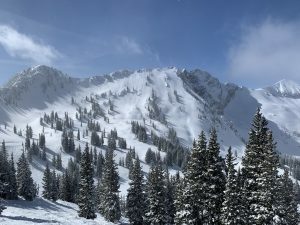 They even joke about it by saying Alta stands for “Another Long Traverse Across!” But all it takes is one memorable run to make you forget the traverse that got you there. Alta, Utah, began as a silver mining town in 1865. At its peak in the late 1800’s it had an estimated population of 8000 and about 180 buildings – 26 of which were bars. Apparently the Utah liquor laws were different back in those days. By the 1930s the mining boom was over and most of the buildings had been destroyed by a series of avalanches. Adventurous skiers had begun hiking up Little Cottonwood Canyon to enjoy what is now the Alta ski area. 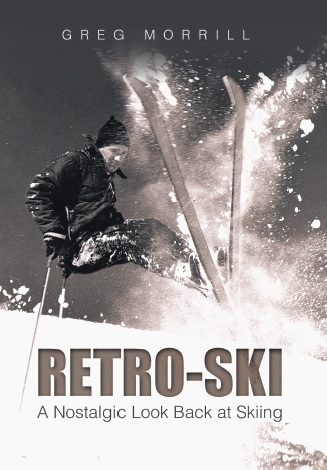 In the winter of 1935-1936 the United States Forest Service retained a professional ski jumper, Alf Engen, to examine potential sites for ski areas and Alta was one of the sites Engen visited. In 1937 based on Engen’s recommendations, the Forest Service obtained surface rights to 1800 acres from George Watson who had purchased most of the mining property in the canyon. (The Watson Shelter is named for him.) The Salt Lake Winter Sports Association raised the money needed to convert an old mining tramway into a chairlift and on January 15, 1939 the original Collins lift went into service. 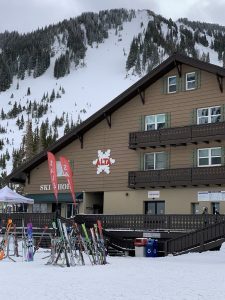 So this season marked Alta’s 80th as a lift-served ski area. I can tell you from first-hand experience that it’s still going strong at 80!